Now that the summer is here, everyone is looking for ways to get a bit more shade in their backyard to protect them from the heat. A little bit of shade make a hot summer day much more enjoyable and offers a bit of protection against UV rays. A patio umbrella is the preferred way of creating a cool corner in the yard, protected from the sun. A new patio umbrella usually comes without a stand. 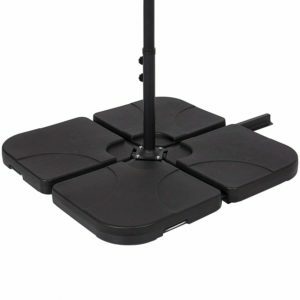 Stands have to be purchased separately and fortunately, there are plenty of models to choose from. Usually they are made from plastic or need to be filled with water but there are other options as well. We picked 10 different patio umbrellas that are worth spending money on. Here is our selection list for the top 10 best patio umbrella stands. 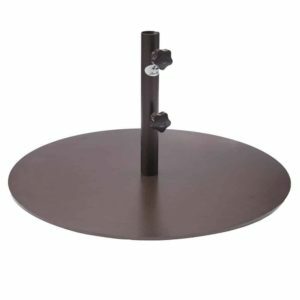 Blissun patio umbrella base stand is a great pick for the ones that are looking for a more stylish model for their yard. It is made using solid concrete and weighs about 35.6 pounds. It should be heavy enough to sustain the weight of a regular patio umbrella. Being made from solid concrete means that it will not need to be filled with water. It is quite sturdy and solid but being made from concrete will make it difficult to move around. However, it is quite reliable and looks much better than the ones that need to be filled. To give it a more stylish look, the concrete has been coated with a bronze finish. It will not rust over time and it will protect the concrete. The stand will work with most umbrellas as it comes with an adjustable piston and a knob that will keep it tight into place. Abba Patio steel umbrella stand is a great pick for the ones that need just something basic without having to bother too much. It does not need to be filled since it is made from solid steel and weighs about 55 lbs. which should be more than enough. The stand works with 6 foot and 9-foot umbrellas. It can be used trough patio tables and does not get knocked off by the wind. It can even be used at home or for commercial use. 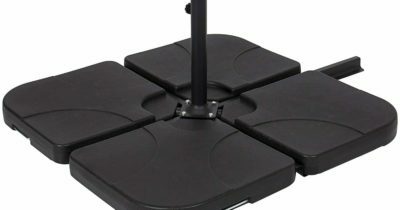 The base plate measures 27 inches in diameter and the height of the support is 13.8 inches. As far as construction goes, the base is entirely made from metal and has a brown power-coated finish. It is fairly durable and does not get chipped or get rusted over time. 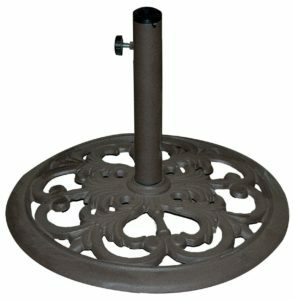 It is on the expensive side but it is also one of the heaviest patio umbrella stands available. 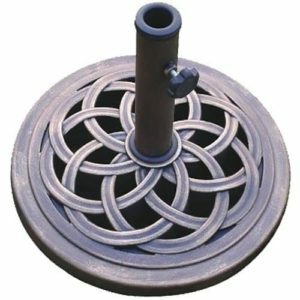 Abba Patio round umbrella stand is one of the most recommended picks in our list. While it might not be the hottest selling one, it gets the job done and was made to be as practical as possible. The stand is made only from recycled plastic which is a major plus for the ones that are concerned about the environment. It is also lightweight but when filled, it will be about 50 pounds which is enough to hold in place even very large patio umbrellas. 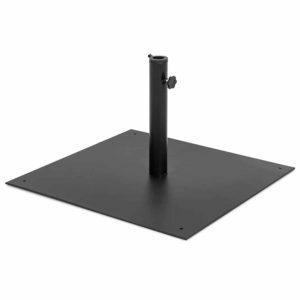 According to the manufacturers, the stand can support umbrellas that are up to 11 feet. Because it is 50 pounds when filled, the stand remains quite stable even in windy conditions. Combined with the fact that it is not that expensive, the Abba Patio stand offers great value for money. EasyGo patio umbrella stand is a great pick for the ones that have a limited budget and are looking to spend as little as possible. This inexpensive model looks quite stylish despite the fact that it is made from plastic. The stand has a bronze finish and needs to be filled with water. It has a capacity of 5.8 gallons and when filled weighs about 74 pounds which is more than enough to hold even large patio umbrellas. In terms of reliability, the stand is heavy enough to hold an umbrella even in windy conditions. 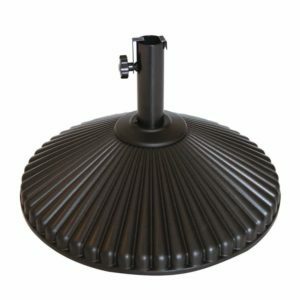 The pole can have its diameter adjusted and features and screw in the knob that fixates the umbrella in place. The Best Choice Products patio umbrella stand is a simple product that uses a basic design. It is a classic stand made mostly from plastic and with a metal crossbar that is held down by the weights. The weights are actually simple squares made from plastic that can be filled with water. There are 4 in total which means that the entire stand is much easier to move around wherever it is needed, piece by piece. Having a design with 4 individual plates makes it much more practical than other models in our list especially for the ones that need to move their umbrella quite frequently. What is important to know is that the stand does not include the crossbar which might be seen like a turnoff. Sunnyglade outdoor patio umbrella stand can be a great alternative for the ones that do not want the classic stands that have to be filled. It is made from cast concrete which makes it a bit more convenient. 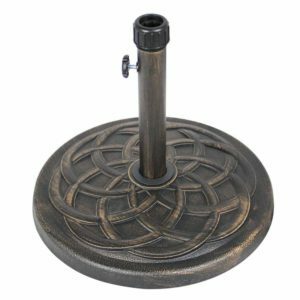 The umbrella stand has a stylish bronze finish that will not get chipped or rust over time. It can be used in all weather conditions. The stand weighs about 30 lbs. which might not sound like much but it can sustain a medium size umbrella. Inside the package, users will get the base stand and 2 couples in the pole. It has a securing mechanism that keeps the umbrella rod properly in place. The stand also comes with a rather low price tag which makes it an appealing purchase. Topishade iron umbrella stand is a great pick for the ones that do not like the fillable ones. It is made from cast iron and a bronze finish that prevents it from rusting. It will survive in all weather conditions but because it is made entirely from iron, it is a bit more difficult to move around. The base of the stand works with almost all umbrella poles. It has a thumb screw that keeps the umbrella securely in place while the stand does not move around and feels quite stable. It is about 20 inches in diameter and weighs 30 pounds. As far as build quality goes, the cast iron stand feels quite durable. The design makes it much more stylish than the models that need to be filled in with water or sand. At the same time, being just 30 pounds makes it a bit easier to move around. 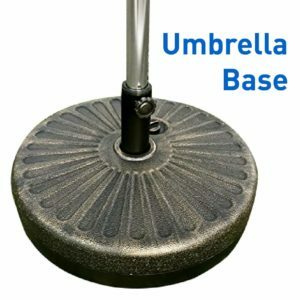 US Weight fillable umbrella base is a great pick for the ones that are looking for something simple. It is a regular umbrella stand made from a durable plastic material that can be filled with water or sand. If it is fully filled with water, the base will weigh about 50 lbs. which should be enough. The manufacturer recommends using the stand with a regular patio table to give the umbrella a bit more stability. The stand is available in a fillable version and a version that is already filled with concrete. The fillable version is a bit more practical as it can be emptied before relocating it. In comparison, the model filled with concrete is a bit heavier and will provide more stability. Best choice products square patio umbrella stand is probably the most basic option that was selected for our list. It has a very flat base made entirely out of steel and a tall stand tube. The entire stand is coated with a black finish that will protect it over time. Since it is made entirely out of steel, the stand is a bit heavy. It works with umbrella poles of up to 2 inches and should provide good enough support even in windy situations. Because of its flat base design, additional weights can be placed on top. The minimalistic design also gives it a lot of versatility. It can be used with a regular patio table or it can even be buried into the ground if needed. Additionally, the twisting knob will help keep the umbrella properly in place. The DC America cast stone umbrella stand is not only affordable but it is surprisingly stylish. 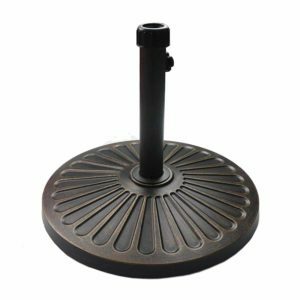 Unlike regular plastic stands that need to be filled with water, this one has a bronze finish and it is completely rust resistant. Being made from cast stone does mean that it is a bit more difficult to move around since it cannot be emptied. However, it feels more stable and offers better support for patio umbrellas. The model also has a stylish design that sets it apart. 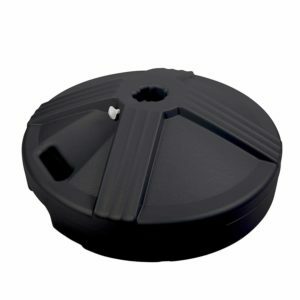 In the middle of the base, a plastic insert was added that can support umbrellas with pole diameters between 1 and 1 ½ inches. If the plastic insert is removed, it can work with poles of up to 2 inches. Patio umbrella stands are usually sold separately. Umbrellas do not come with stands for to a certain degree that is a good thing. Usually, the ones that do come with their own stand, include a plastic one that needs to be filled with water and they do not look all that great. Fortunately, patio umbrella stands can be found as stand-alone items. Usually, there are a few things to look out for when searching for a patio umbrella stand. They are not all the same and it is possible to get a stand that simply does not work with a particular umbrella. Here are some of the most important aspects. Supported umbrella pole diameter. This can vary from one stand to another. Usually, the work with poles between 1 and 2 inches but that is not always the case. It is important to pay attention to this aspect. Stand weight. The stand weight is important because a large umbrella will need a large and heavy stand. It is better to go for a fillable stand if the umbrella is very large and have it filled with sand. Smaller umbrellas can work with a solid stand that does not need to be filled. Fillable or solid. A fillable umbrella stand is a bit more practical in the sense that it can be emptied out before being moved. Solid ones made from stone, concrete or metal, are a bit more difficult to move around. Even if a patio umbrella stand may seem heavy and difficult to move around, the heavier it is, the more stable the umbrella will be. Surely, lighter ones can work but only with smaller umbrellas. Fillable ones are more versatile but they usually have an unappealing design. With all these variations, picking an umbrella stand might seem a bit confusing but truth be told, very few people will actually look at the stand so their design does not matter all that much. What matters the most is for the stand to be stable enough to hold a patio umbrella. We picked several stands of various sizes and weights but it is important to have a close look at each model in order to avoid getting something that might not be suitable.